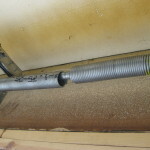 The garage door springs are the hardest working component of the garage door system. Whether it’s a sectional door, or a one-piece door, the springs do the lifting! 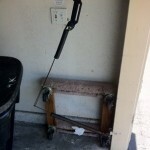 Typically the springs are the first thing to break on a garage door. Every time you operate the door, the springs either wind or unwind. When the door is closed, the springs are in the “wound” or “extended” position. When the door is closed, that’s when there’s the most tension on the springs…..and that’s almost always when they break. 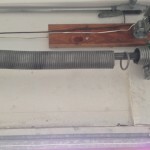 How do you know if you need a garage door spring replacement? 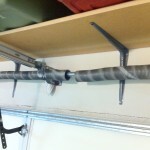 If you go to open your garage door and it only comes up a short distance, you might have a broken spring. With a broken spring, the door is too heavy for the garage door opener motor to lift and it cuts out because the broken spring is not helping to lift the door. Also, check to see if there’s a space between the coils(see pics. above). If you see a 1″-3″ gap between any of the coils, that’s a sure sign the spring is broken and must be replaced. Lastly, if the door opens extremely slow, or the motor sounds like it is really straining, that would be another symptom of a broken spring. 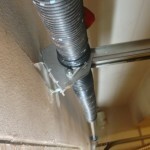 Garage door torsion springs (sectional door), are rated in “cycles” and garage door extension springs (one-piece door) just have a flat warranty. A good cycle rating for a torsion spring is 10,000 cycles. This means that if the correct size spring is used, it should last for about 10 years with normal usage. 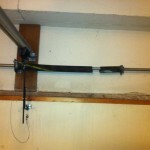 replace both springs (if there’s 2) with the correct size springs for the weight of your garage door. See pricing page for more info. *oversize doors extra, call for pricing. *oversize or “carriage house” doors extra, call for pricing.